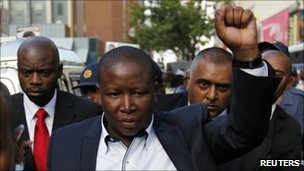 The head of South Africa's ANC Youth League, Julius Malema, has taken the witness stand in Johannesburg in a high-profile hate speech trial. An Afrikaans community is seeking a ban on Mr Malema singing a controversial apartheid-era song with the words "shoot the Boer". "Boer" means farmer in Afrikaans and they say its use incites racial hatred. Mr Malema began his testimony insisting he is not an aggressive man, and that the song should not be taken literally. Hundreds of protesters are outside the High Court to witness the dramatic trial, which is being relayed via huge television screens to those outside. Prosecutors said that as a leader of the African National Congress (ANC), Mr Malema has a mandate to speak on behalf of the people and that was what "makes people so intensely anxious about what you say and do". Mr Malema denied being a "rabble-rouser". "You need to understand the context of the song," he said in court. "This song is a historical song which is still relevant to the current conditions of our struggle. For as long as we didn't declare the struggle to be over, the song remains relevant." Key ANC figures who have come to lend their support to Mr Malema have said the song is part of the ANC's history, part of their struggle, says the BBC's Karen Allen who is outside the court. Far from it being a direct call to violence, they say it is a way of commemorating South Africa's recent history, our correspondent says. Mr Malema sang the song at a rally in Johannesburg last year, causing a row in a country where racism is still a challenge, 16 years after the end of white minority rule. AfriForum, an Afrikaans pressure group, brought the case against Mr Malema. The group says his actions are to blame for a spate of murders of white farmers. According to Tau-SA, an South African agricultural union, 1,489 white farmers have been murdered since 1990. Since the trial began on 11 April, key figures, including ANC Secretary-General Gwede Mantashe, have defended their youth president's right to sing the struggle song. Winnie Madikizela-Mandela, the ex-wife of former President Nelson Mandela, has also stood by Mr Malema.